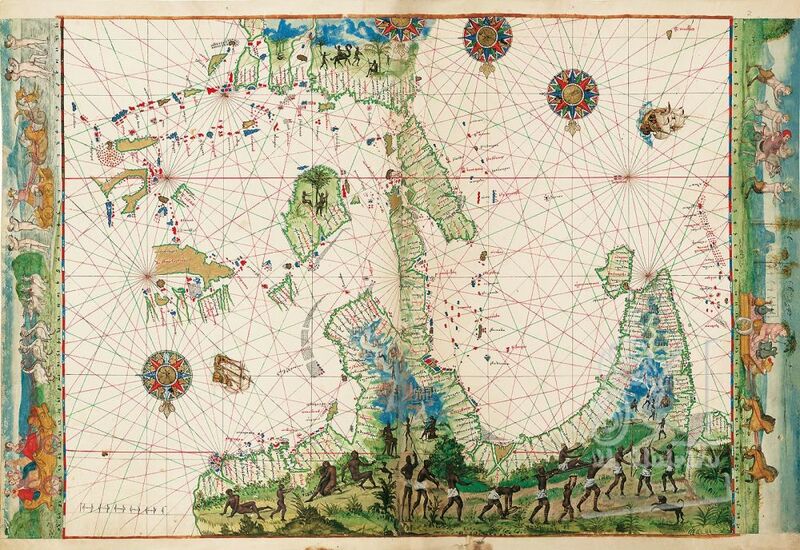 As is characteristic of Portuguese cartography dating from the reign of King João III (r. 1521-1557), areas that were not well known were left blank, which were located, above all, in the eastern part of the Malay Archipelago. The outline of the coasts of Asia is quite accurate but one can note a tendency to shorten the continent in terms of longitude, which could be the result of two factors: on the one hand, the absence of an accurate system to measure this co-ordinate at the time, which was instead determined by estimating the distances traversed; on the other hand, with the unstated intention of ensuring that as many lands as possible that were of commercial interest could be squeezed into the half of the world that had been assigned to Portugal by means of the Treaty of Tordesillas. As could be expected of a map inspired by Portuguese cartography, all of which was nautical, the toponyms are exclusively coastal, which meant that the interior could be used for illuminations. Of the illuminations, the ones that cover the continental regions of Asia are quite realistic. In the background, drawn in blue as in Flemish paintings and just like in the previous map, the regions of India, the Indochina Peninsula and Australia or “Java Major” contain scenes that were apparently meant to be more decorative than documental. As was habitual in coeval Portuguese cartography, minor coastal features, such as the innumerable rivers and estuaries along the Indian coast, were greatly exaggerated. In areas that had larger populations and were more frequented by the Portuguese, such as India, the toponyms are practically all indigenous names; it was in marginal areas, such as the eastern end of the Malay Archipelago and in China that Portuguese toponyms are more frequent. A lacuna in this map, which has a parallel in coeval Portuguese cartography, is the entire northern region of the Philippines. The Philippines as a whole began to appear in Portuguese cartography only after the Spanish conquest (1571); the oldest known correct and complete representation of the archipelago can be found in an engraved map by Petrus Plancius, modelled on a drawing by Bartolomau Lasso datable to 1582. Unlike the Philippines, the Portuguese had been well acquainted with the area of the Moluccas since 1514. In this present map, the Moluccas have been portrayed as a chain of five islands arranged from north to south along the coast of Halmahera or Gilolo, curiously enough drawn without any toponyms at all.